Nothing really. Just action, adventure, and the need to catch a movie. On a quest to hunt down black powder, a group of mercenaries find themselves caught in the desert lands hunted by nomads. Their party of four is quickly cut down to two people when something attacks them. A day later they find themselves at the Great Wall (of China, in case you’re wondering), the violent nomads at their backs and a whole army in front. Taking their chance with the army at the wall, these two mercenaries find a whole lot more than black powder. This was another of those movies that weren’t exactly on my to-watch list, but in need of something to do this was the number one choice. And it made for a fun evening. The Plot . . . Very interesting story. Cough it up to the history buff in me mixed with the myth and legend side of me and you have the me that totally geeks out. That’s what this story was. As I admitted, this movie wasn’t exactly one I was dying to watch (and I’m admitting it now. Asian movies is that particular genre that I have to be in the mood to watch. They just aren’t my cup of tea, so to speak) but the idea of a myth or legend explaining the Great Wall of China did appeal to me. And I’m don’t know much about Chinese myths and/or legends so wether or not this particular myth is unique or not, I cannot say, but I did like the concept of it. An elite army defending all of China not agains the Huns, but . . . other things, is just fascinating. It seems a unique and original story, at least to me. It’s the first movie I’ve seen, or even heard about, that addresses a myth or legend about the Great Wall so . . . high marks in my book. The portrayal of medieval China (I’m taking a stab at the era and I know I’ve probably made an incorrect guess, but I’m too lazy to look up this fact right now. I have an excuse. I’m typing this through a headache) was amazing. The costumes, the weapons, the personality. I loved it! Matt Damon (William) and Pedro Pascal (Tovar) worked well together. 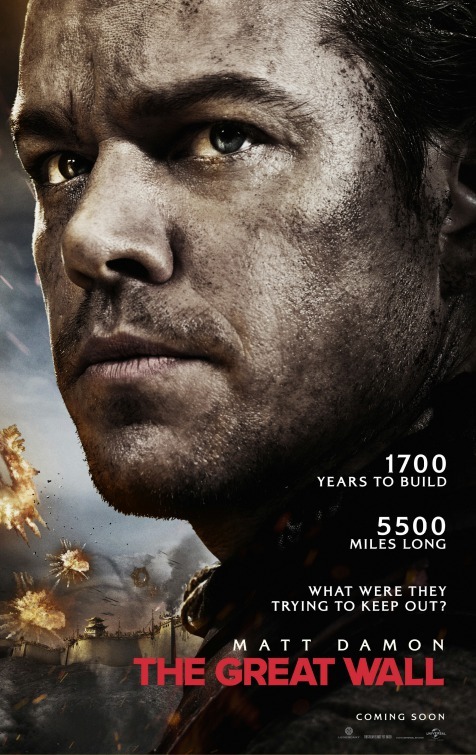 And I’ll be honest, I wasn’t too sure about Matt Damon starring in a Chinese-ish movie, even though he was playing the part of European mercenary. And I’ll be honest (times two), I really hope to see more of Pedro Pascal. He did a great job playing the comic relief and the added tension to the plot. Tian Jing (Commander Lin) was brilliant! I haven’t seen her act before this and she did such a good job standing up with actors like Matt Damon and Willem Dafoe (Ballard). It was nice to see this dynamic. Action shots were well done. Not too fast and not drawn out either. It moved the story along nicely and kept things interesting. Great work! If we’re talking a must watch, yes. This movie definitely is a must watch. If we’re talking about a must add, that’s a tougher one. I think this is worth adding to your movie arsenal. It’s a great action flick, the plot is unique, and the acting isn’t horrible. It’s a great movie for those kinds of nights (or days, or whatever) when you have no clue what to watch. I think it’s worth the investment.